Thanks everyone for getting in your donations for the flood relief contest. We are up to $180 dollars now!!! And remember it doesn’t matter if you donate $5 or $50, every bit helps the farmers out and gets you a contest entry. I also wanted to add that you should still enter even if you’re not a knitter as I’ll have a nice non-yarny prize for you if your name is drawn. If you haven’t entered yet, check out the sidebar for information. You have until the 29th to get your donation in. 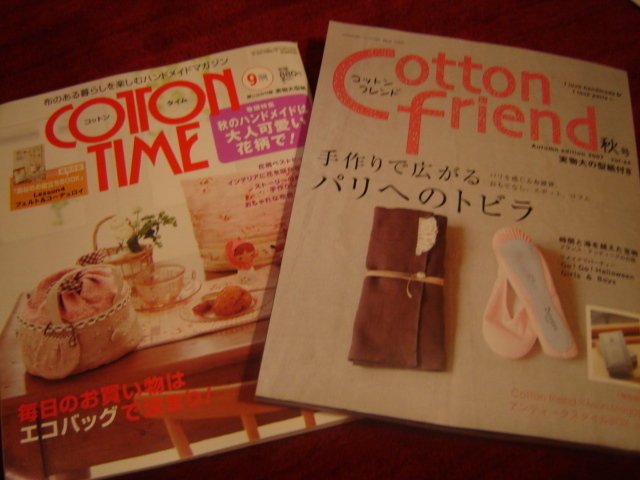 After a year now of wondering about all the Japanese craft books and magazines I keep seeing on the blogs, I finally broke down and ordered two from Superbuzzy to see what all the fuss is about. Wow! These magazines are beautiful!!!! Such a different style from the US magazines and the detailing is amazing. While I do wish I knew Japanese so I could read everything, the pictures and patterns are enough in themselves and well worth the $17 price tag. And the schematics are great, so I should be able to figure everything out.